Bexhill United manager Ryan Light says there’s a real buzz around the football club on the eve of the new season. The Pirates will kick-off their 2018/19 Southern Combination League Division One campaign this coming Saturday) in positive mood following some eye-catching summer signings and encouraging pre-season results. 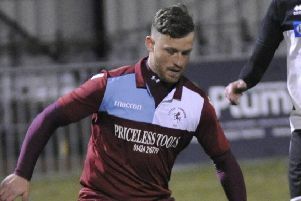 Bexhill have brought in prolific striker Danny Leach from Hailsham Town, skilful creative player Allan McMinigal from Westfield, former Hastings United youngster Jordan Harley and midfielder Jamie Bunn, who helped Langney Wanderers finish runners-up in the same division last term. “I’m delighted with the squad,” he continued. “If those two come in, that will take the number to 20 and that’s the number I wanted. “That (scoring goals) was the main issue we had to address and we should’ve addressed it with the signing of proven goalscorers like Danny Leach. “We know we need to score goals and we’ve tweaked the system as well. We’ve also had the emergence of Terry Robinson-Wickenden, who really has played well through pre-season - that’s been a nice surprise for us. Bexhill, who have lost only Corey Wheeler to local football, finished seventh last term having come 10th the previous year and Light is eager to continue the upward trend in his third season at the helm. “The goal has got to be to improve again,” he went on. “And with the squad we’ve got, there’s really no reason why we shouldn’t improve our league record dramatically. I think there’s six teams that can win the league and we’re one of those. “(AFC) Varndeanians are going to be strong, the teams that have come down (Littlehampton Town and Worthing United) you’ve got to be wary of, Southwick will dramatically improve and Hailsham will be there or thereabouts. Bexhill will get underway by making their first ever trip to an Alfold side which has come up from Division Two. Bexhill’s final pre-season friendly, away to Jarvis Brook last weekend, was cancelled by the opposition due to player unavailability. In fact, their last two scheduled warm-up matches didn’t go ahead, although Bexhill did win the three fixtures that were played. “We’ve had a good pre-season,” said Light. “The games we did play, we’ve been excellent. We’ve looked quite sharp and performed really well. Bexhill should be close to full strength on Saturday, although Leach has a two-game suspension carried over from last season.